Here is an article that appeared on the National Geographic Website after last years event. Enjoy ! 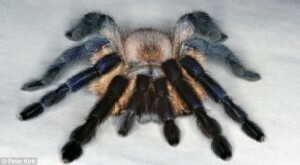 A Socotra Island Blue Baboon spider took top honours at the 29th Annual Exhibition of the British Tarantula Society. This Socotra Island Blue Baboon (Monocentropus balfouri) captured top honors at this year’s British Tarantula Society exhibition. 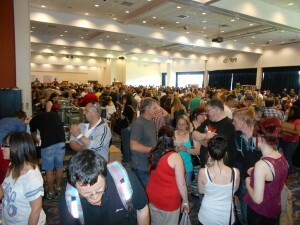 This is the big one, the prestige event, the oldest and best-attended show of its kind anywhere in the world. A trophy here can make a breeder’s reputation. As ever, the judges were looking for perfection: a glistening coat, an alert, active demeanor, correct proportions, coloring, and conformity to type. Stance is important too. The legs—all eight of them—should be upright and perfectly poised. That’s right. You heard correctly. All eight. Welcome to the 29th Annual Exhibition of the British Tarantula Society, the Crufts of the spider world, held on May 18 in Coventry, in England’s West Midlands, and attended by more than 30,000 tarantulas and their enthusiastic keepers. The winner of this year’s Best in Show was a Socotra Island Blue Baboon spider owned by Mike Dawkins, a relative newcomer to the tarantula-keeping community who had entered the competition for the first time. What makes a prize-winning tarantula? “A freshly molted adult offers the best opportunity for winning, as the colours tend to be brighter and more prominent,” said Pete Lacey, a breeder who won Best New World Arboreal and Best Old World Arboreal at this year’s show. “The abdomen shouldn’t show signs of overfeeding but be lean and rounded,” Lacey added. A full head of hair helps too. “When we judge a tarantula, we’re judging its keeper as well,” said Ray Hale, a veteran judge at the show.This year’s winning entry stood out for its vibrant good health, with a few added points thrown in for rarity—there aren’t ever many Socotra Island Blue Baboons in the running. They weren’t just society members (who range in age from 4 to 86) but a large and curious public—something Hale and his fellow tarantula lovers are keen to promote. “We particularly like to see kids get interested in them,” said Hale, who acquired his first tarantula when he was in his early teens and has been keeping them as pets ever since. Theraphosidae—the Latin name for the tarantula family—are a way of life for Hale. 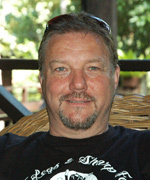 Now 52 and retired from his job as a health and safety officer in the construction industry, he and his artist wife, Angela (also an enthusiast), spend much of their year researching, writing, and lecturing in schools and on cruise ships. They often travel to Malaysia and Borneo to photograph tarantulas in the wild. The Hales keep 150 tarantulas, representing 30 different species, at their home on the Sussex coast. The spiders live in separate glass tanks in a room that doubles as Ray’s office and research library. Indeed, two-time Best in Show winner Pete Lacey works in advertising in London. Nor are tarantulas just a “guy thing,” Hale added. Far from it. The split between the sexes in the tarantula-keeping community is fairly even, with young women in particular increasingly buying them as pets. They come in a rainbow of colors too—red, blue, green, brown, black, spotted, striped, and multicolored. The Socotra Island Blue Baboon spider has tawny hairs on its body and iridescent, blue legs. 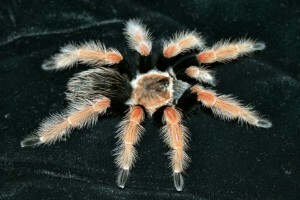 The Chilean Rose, on the other hand, the most commonly kept pet tarantula, is brownish but with a scattering of the distinctive pale pink hairs that give it its name. Pete Lacey’s personal favorite is Poecilotheria metallica, a spectacularly iridescent blue tree-dwelling species from India. But he’s also partial to the Green Bottle Blue tarantula—a New World species from Venezuela that as it matures changes colors and patterns from a tiger-striped spiderling to an orange adult, with an aquamarine carapace and blue legs. Comely and exotic though they may be, tarantulas are no playthings. With larger species having fangs up to three-quarters of an inch long, their bite can be painful and unpleasant, although their venom isn’t lethal to humans. One tarantula defense mechanism is to flick its barbed body hairs, or bristles, at a potential attacker—something that can happen if the spiders are handled or interfered with too much. They’re also quite fragile: Drop a tarantula, and it can easily die of its injuries. “That’s why we as a club discourage handling tarantulas,” Hale said. In fact, anyone seen handling a tarantula at the show is disqualified and asked to leave. Tarantulas, Hale concluded reverently, are to be looked at and admired and appreciated for the marvels they are. Ray Hale, BTS Exhibition Organiser and Arachonophile!